ENMTools tests can take a long time to run, due to the number of Maxent runs necessary to construct a distribution of expected overlaps. For that reason, people occasionally ask whether there's a way to break up analyses and run them on a cluster, or just manually spread them across several computers. People also occasionally ask whether it's possible to use ENMTools with non-Maxent methods of ENM construction. There's no built-in way to do either of these at present, and given the number of different ways that people might want to do this I'm not sure there will be. However, it CAN be done! It requires a bit of extra work, but it's not too bad, particularly with a few simple new tools that I'm presenting here. Let's say you want to do an identity test, and split it up so that replicates are submitted to a cluster. For starters, we'll just set up the test in ENMTools as usual but de-check the box marked "Run Maxent". 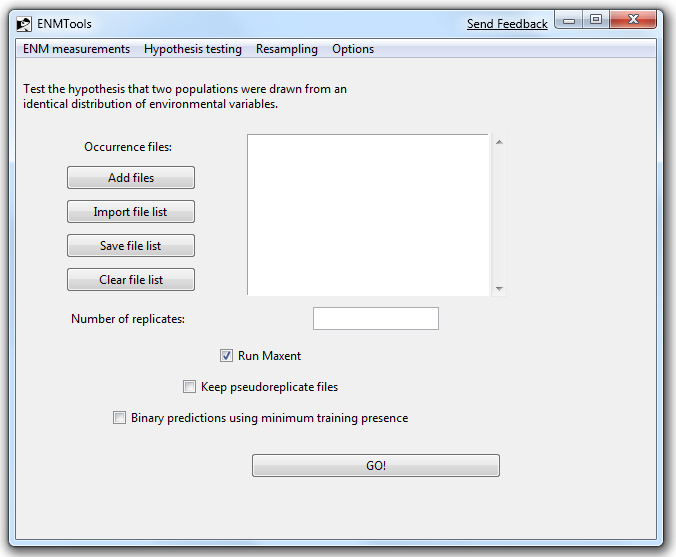 This will cause ENMTools to generate the data sets necessary for the test, but the data will not be sent to Maxent to analyze. Okay, now we have a file that has a whole bunch of replicates in it. What we would like to do is analyze each of those separately. I've got a really simple no-frills script here that simplifies this process. All you need to do is drop this file into the directory where your file of replicates is, then go to a command prompt in that directory. Type "splitcsv.pl INFILE", where INFILE is the name of your .csv file of replicates. In short order, you will have a new .csv file in that directory for each replicate in the input file. Note: you can also use this little tool to split a large file up by species. It will spit out a file for each unique species name in the input file. Another note: this script will overwrite files without asking, so it's best to run it in its own directory! At this point it's up to you to figure out how to submit jobs to your cluster using the Maxent command line options. One thing to keep in mind: Maxent by default writes to a file called maxentResults.csv. If you've got a shared file system, or just a directory on a single multi-core computer that's being shared by two different simultaneous Maxent jobs, both of those jobs will by default try to write to the same results file. Java will happily allow multiple instances of Maxent to fight over the same filehandle, but what comes out in that results file will be incomplete and quite possibly not useful. I've just set my stuff up so that it writes to different directories, but it's possible that using the "perspeciesresults" option will fix this issue as well. On a side note: if you're doing jackknife or bootstrap on a cluster, you pretty much can't have multiple instances of Maxent writing to the same directory. The perspeciesresults option doesn't work for resampling, and having multiple instances writing to the same output file simultaneously will cause Maxent to fail when calculating summary grids. Just FYI. All right, now you've gotten all of your runs finished and want to bring your data together to construct a distribution of overlaps. This is where a handy new half-developed tool in ENMTools becomes useful: scripting mode. You'll need the newest test version of ENMTools for this. I'll admit that it's a little weird to have a scripting interface for a program that is itself just an elaborate scripting interface for Maxent, but that doesn't mean it's not useful. At present the scripting interface is only hooked up for a few functions, and I'm not even close to writing a comprehensive manual entry for it. However, it works for our purposes. The first entry is the command, the next two are the two files to compare, and the last entry is the name for the analysis. If you're doing a comparison between two species using 100 replicates, you need 100 lines in your script file, each with its own name for generating output files. In cases like this, the "concatenate" function in Excel is your best friend. Once you've got your script file, just go to Options->Run Script File in ENMTools and let it do its thing. This would concatenate all of those output files for I into one csv file that can then be edited in Excel. There's going to be a bit of cleanup to do, since each of those files had its own header line and two copies of each score. That's all fairly easy, though, and should only take a couple of minutes with some clever sorting. Everything I've said here goes for other modeling methods as well - you can generate data sets and analyze them in whatever software you like, and then use the scripting interface to build your distributions. When I get a chance I plan to make an interface that will make the comparison of multiple files easier (i.e., send everything to one formatted outfile). Seeing as I'm currently in a blind rush to finish my dissertation before my postdoc starts, though, I don't think that's going to happen too soon. Steven Phillips just posted a new version of Maxent (v. 3.3.0). I've already used this new version successfully with ENMTools, so hopefully there won't be any unforeseen compatability issues. One of the coolest features of the new version is the capability to do replicated runs, allowing "cross-validation, bootstrapping and repeated subsampling." New executables of ENMTools for Windows and OSX! Hooray! Thanks to Activestate's PerlApp (which is awesome), we now have executable versions of the testing build of ENMTools. You can download the new Mac OS X executable here, or the Windows executable here. For some reason the OS X executable is way bigger than the Windows version, and it only launches from the console on my Mac (double-clicking doesn't work). If anyone has insight into either of those issues, please let me know. I should also mention that neither of these builds have been tested extensively yet, as they're hot off the compiler. Please check your results and let me know if anything comes out weird. Tkx version ready for testing! I'm excited to announce that there's already a test version of the new Tkx ENMTools. And here's the big news - IT WORKS ON OSX! Porting from Tk to Tkx was a bit of a hassle, but once that was done it turned out to be trivial to make it work on a Mac. It also has the side effect of making ENMTools look considerably more modern on a PC than it did before. Contrary to my earlier statements, though, I think we're going to keep the retro look of the web page. If you're as deeply in love with Sparklee logos as I am, you can actually save the above logo into the same folder as the new Tkx ENMTools and it will show up when you start up the software. ...assuming you're in the directory where you've dropped the perl script. Now this stuff is all very, very new. We've done some testing, and things seem to be working correctly. Please email Dan (danwarren@ucdavis.edu) if you hit any snags. Oh, and there's a slight bit of weirdness on OSX in that it seems to want to draw the window slightly smaller than it needs to be, no matter how large I tell the program to make it. Just drag the bottom right corner out a bit and everything's fine. If anyone happens to know what to do about that little glitch, I'd appreciate the info. We're starting to work on the new Tkx version! Okay, so it's not Rembrandt, but it at least looks like something that was written in the last twenty years. I'm hoping to have an alpha version of it up on the web site in a few days. The tabs are gone, replaced by a more normal-looking menu system. I'm also slowly but surely going to start adding more flexibility in how Maxent runs are conducted, with the ultimate goal being that the user can set any Maxent option from within ENMTools and apply that to all runs automatically. That's a bit of a ways away, though. As it stands, ENMTools basically is a testing version. We're about to crank out a version that only has the bits in that we've worked with extensively, and that already have some associated published paper that we can point to and say "here, this is what this tool does". At the moment that's just the overlap, identity, and background tabs.